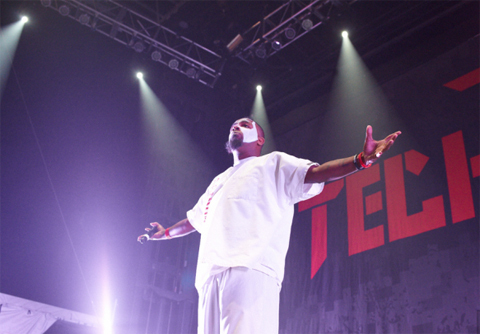 There’s nothing quite like catching Tech N9ne and Krizz Kaliko take over the main stage at the Gathering Of The Juggalos and this year was no different. SPIN was in the house this year as ICP’s 13th Annual Gathering Of The Juggalos brought together some of the biggest names in indie and mainstream hip hop including Tech N9ne and Krizz Kaliko. Kansas City’s finest is a stalwart speed-rapper, impressive for his dynamics and crazy-person delivery (also, dubstep beats). But equally awesome was his onstage companion, Big Krizz Kaliko, who matched Tech’s performative energy and ramped it up with gorgeous singing. Of course, Juggalos love these dudes for their buckles as well as their “psychoses,” but Tech’s got a Gathering hit in his 2009 track “Areola”, an anatomically specific bass track that was accompanied by mass flashing of said body part. The new article also includes recaps of performances from Geto Boys, Danny Brown, Twiztid, Rittz, and many more.